The stars (particularly the bright one over the cave near Bethlehem) provides the cool blue light of this scene. In contrast to that is the warm yellow/red glow of the shepherd’s camp fire. You can see highlights of that warm glow on the figures, sheep, trees & surrounding ground. The angel provides a feint pale yellow glow as well. Five un-named shepherds, lots of sheep (Ovis aries) & the angel from heaven. This scene uses the same background (mountains, hills, trees, etc) as the previous scene (Luke 02 – Nativity SET 02 – Scene 03 – Shepherds), since the events of this current scene occur only a moment later in the narrative. I am also pleased with the expressions on the shepherd’s faces. The Bible states “They were terribly frightened,…” so it was appropriate to show them expressing terror. Notice the one shepherd on the right, on his hands & knees. In front of him is a sleep sheep just waking up, disturbed by the shepherd’s sudden movements no doubt. All the rest of the sheep are still sound asleep! I expect that animals are not scarred of angelic beings, as we might be! I like the two shepherds huddling & grasping hands together on the left, whilst another has run behind a tree! I also chose to show the green hooded shepherd who’s face we haven’t seen in any other of the scenes drawn so far. He has a true expression of terror! 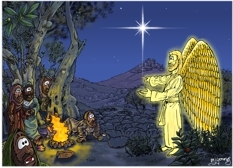 Notice that the angel is pointing towards the glowing cave mouth, in which Jesus has just been born. As I noted for scene 03: I looked for photographs of a suitable view of Bethlehem on the internet for this scene. The photo I found shows the modern city, which is indeed built on a hill. My version of Bethlehem is as a large village or small town, since I believe there were far fewer people living in the place in first century Palestine/Israel than there are now. Shepherds: an occupation with a bad reputation?! There are many references to shepherds & shepherding, both descriptive & figurative, in the Bible. The Old Testament (OT) patriarchs Abraham, Isaac, Jacob, Moses and David were all shepherds at some time in their lives. The chief task of the shepherd is to see that the sheep in his care find plenty to eat and drink. Flocks of sheep (& goats) are not fed in pens or folds, but, year round, must depend upon foraging for their food. The shepherd finds good pasture & leads his sheep to that place. The flock is watered, usually at noon, & led back to the sheep fold in the early evening. The shepherd takes careful note of the number of sheep in his care, seeking any strays or lost ones. The shepherd also defends his sheep from wild animals or thieves. In the OT we read that the Egyptians despised shepherds (see Genesis 46:35). And by the first century AD it appears that shepherds had quite a bad reputation. Rabbinic literature lists the occupation as among the most despised! What is amazing, given that reputation, is that shepherds were the very first people to be told the news of the birth of the Messiah, Jesus the Christ. Clearly the Lord God esteems shepherds, even is his people generally did not!